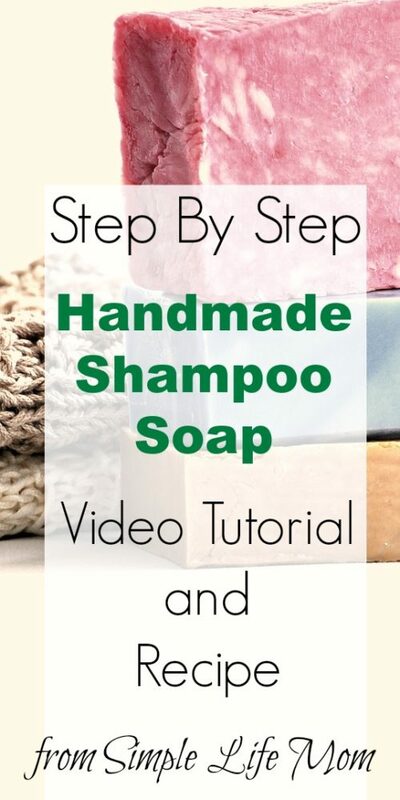 I’m excited to be able to bring you a Video Tutorial: Shampoo Soap Step by Step. In this video I will walk you through how to make your own shampoo bar soap. Really, this can be watched to get an idea of how to make any hot processed lye soap, as the directions are the same. Only the ingredients are different for shampoo bars. If you haven’t already, please subscribe to my YouTube Channel so that you can get DIY videos as they come out. Regular shampoos are jam packed full of ingredients that are not good for your skin, brain, organs, etc. I had an odd experience the other day. I was out without my shampoo bars and had to use a shampoo product that was “clean and clear”. Even looking at the ingredients I decided it was better than most. After I washed my hair there was this plastic like slimy substance in the mesh shower drain. It wasn’t just soap bubbles, it was really odd. Just another convincing incident to make me love using my own. You can spend a lot of money of organic shampoos, or you can simply make your own shampoo bars. The difference between these bars and other soap bar recipes is that they are made with a number of more expensive oils (though a batch is still cheaper than what you would spend on organic shampoo) that are very nourishing and healing to your hair. You can use these on your entire body if you wish. They are all around great bars. For shampoo bar recipes, go to 7 Shampoo Bar Recipes. For those of you who have never used shampoo bars, you need to know that it will not feel like your usual shampoo when you use it. Your hair is used to being over-stripped of it’s natural oils and then piled high with -usually- not so healthy oils. It takes a week or two for your hair to break this cycle. Once it does, your scalp will produce enough oils to create a beautiful shine, without you having those oily problems like you used to. To use, just lather in your hands or on a washcloth like you would a soap bar and massage through your hair. Hi Kelly. Thank you very much for this informative information on making homemade soap and shampoo bars. I’ve been really interested in trying this out, so I think that I’ll just have to be brave and go for it. This and many other processes are things that our ancestors knew how to do, but we have forgotten them thanks to our industrialized culture. It is so important to learn these types of skills. Saying hello from the HomeAcre Blog Hop #80 :). Great video, Kelly! I had no idea lye would heat up water so quickly – amazing! Thanks for sharing this at Savoring Saturdays! Thanks making your shampoo bars tomorrow and this helped me feel better about doing it. With four other people and we have never made soap before this will be an experience.! This is the year! I bought my lye over the holidays and as soon as I’m running low on my shampoo bars (5 for the price of 4 :-), I’m going to do it. My husband said he would helped as he remembered helping his grandmother make soap when he was very young. Thanks for sharing your recipes! In some area, you asked if anyone wanted to share their recipe or something along those lines, now I can’t find it but I want to share one that I made recently that I really like. Two Tablespoons finely chopped fresh catnip leaves, not packed. All the oils go in the crock pot on low. Pour lye into water, mix and wait until it’s clear then pour that slowly into the oils. Stick blend until it reaches trace. Put the lid on and cook it until it doesn’t zap you. I cooked mine for 45 minutes and stirred it a couple of times. Just before I poured it in to a mold, I quickly stirred in the fresh catnip. This gives the already green soap some dark green bits and it’s really beautiful. I use it as shampoo and body bar. It’s my new favorite and I couldn’t have done it without your information, Kelly. Thanks! Hi! This looks amazing- do you list the recipe? Would love to try this, but it doesn’t match up with the 7 shampoo soap bar recipes.